Fill out the form below of call us at 843-407-9020 to schedule your appointment today. If you live in Florence, SC or Darlington, Marion, Hartsville, Timmonsville, or any other surrounding area of Florence, then look no further for your dog and cat care. Our doctors are licensed veterinarians, treating dogs, cats and pocket pets. Your pet's health and well being is very important to us and we will take every step to give your pet the best possible veterinary care. Cashua Veterinary Care is a full service animal hospital and will take both emergency cases as well as less urgent medical, surgical, and dental issues. Our veterinarians are experienced in all types of conditions and treatments. Beyond first rate pet care, we make our clinic comfortable, kid-friendly, and a very calm environment so your pet can relax in the waiting room and look forward to meeting his or her own veterinarian. We have a number of resources for you to learn about how to take better care of your pets. Browse around and look at our articles and pet videos. The best veterinary care for animals is ongoing nutrition and problem prevention. If you want to ask a question call 843-407-9020 or email us and we'll promptly get back to you. Cashua Veterinary Care is very easy to get to, and you can find directions on our Contact Us page. You can also subscribe to our newsletter which is created especially for Florence pet owners. In between your veterinary visits, your pet will benefit from you reading these free informative articles. At Cashua Veterinary Care, we treat your pets like family. Refer a friend and receive $20.00 off of your next purchase! Ask your friends and family to put your name down as a referral. Each month we will add $20.00 to your account for each referral to use towards your next purchase. "All About the Tooth this Month!" February is dental month. Receive a discount when your pet has a dental cleaning in February. Give us a call to schedule your pet for a dental check up and to receive dental information. 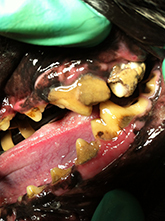 If you want to know the tooth about it, come see doctors and staff at Cashua Veterinary Care! You're only one call away from fresh breath and pearly whites. "Sloppy kisses are more welcome when teeth aren't like this!" 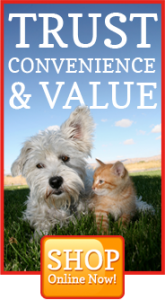 "We value our clients' experience at Cashua Veterinary Care. If your pet or animal is currently a patient, please feel free to email us and tell us your experience. Your testimonial may be posted on our website!" "I was very impressed with the knowledge of the staff when I came in with my puppy! They were very kind and showed lots of compassion for my puppy. I thank the doctors for being there for us...especially for emergency care!! Thanks you guys for being so wonderful!" "The staff at Cashua Veterinary Care were beyond wonderful! Everyone I interacted with was incredibly friendly and knowledgeable. They treated my cat as if she were theirs. They did a great job making me feel welcome and ensuring that I understood everything I needed to to care for my pet." "Cashua Veterinary Care treated all of my pets as if they were treating their own pets. I would recommend Cashua Veterinary Care to anyone who is looking for a veterinarian!" Dr. Kate Atwood is a veterinarian with Cashua Veterinary Care. Raised in Florence, Dr. Atwood is excited to return to her hometown. She is a 2002 graduate of Trinity Collegiate School, and received her B.S. in biology from Furman University in 2006.Dr. Atwood is a 2010 graduate of Ross University School of Veterinary Medicine and completed a year of clinical training at Auburn University College of Veterinary Medicine. Dr. Yarborough is the newest addition to the Cashua Veterinary Care Team. Dr. Wesley Yarborough grew up on a small farm outside of Charlotte, NC and has always had a love for animals. She is a 2007 graduate from Charlotte Country Day School and received her BS in biology from the University of South Carolina in 2011. I am a Veterinary Technician at CVC. I'm excited to say that I have been a Vet Tech for 17 years! I have a BS degree in Biology that I obtained from Francis Marion University. My name is Heather Deitch. I have been a veterinary technician for 7 years. I obtained a BS in Biology at Francis Marion University. I have always had a passion for the well-being of animals. I'm a very big advocate of animal health and safety. I joined the Cashua Veterinary Care team just last year in September. This was the best decision I've ever made because nothing could be more rewarding than taking care of our four legged companions! I have learned so much in my short time here and hope to continue to grow with this practice. He is always around to greet you when you come in the door!! Remember to keep your belongings, especially food, near because I may need to borrow something. Oh, loving on me is the purrrrfect thing to do while making your next appointment!